In 1576, Lord Kenshin Uesugi troops had attacked Noto district, the villgers have no weapons except sickles or hoes, and had been defeated. But even after that all the elderly men in the Nafune village never gave up, then after thinking how to win over carefully they had made masks with wood and beating sounding the Taiko (Japanese Drum), responded to Uesugi troops for the second time and obtained victory finally. This means wearing masks, people get a great power from Okutsu princess God 奥津姫神. People call this as "GOJINJYO RIDE" and has handed a story down from generation to generation up to today. Every year from the July 31st night on August 1st, this memorial festival is held at the Okutsu princess shrine 奥津姫神社, but even in other day it is held at every place. Taiko drum sound consists three steps as (JYO) beginning, (HA) destruction and (KYU) rapid, you can taste, looking, hearing with deep impression. The dance of the masked demons is now an Intangible Folk Cultural Asset designated by Ishikawa Prefecture. "Drums for the Shinto Gods"
This is a database of the more than 5000 doll paintings by Kawasaki Kyosen 川崎巨泉（1877-1942）. 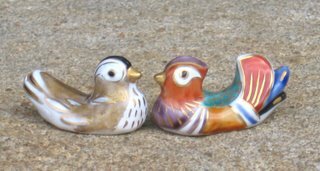 Click on any of the numbers here to see more Doll items. 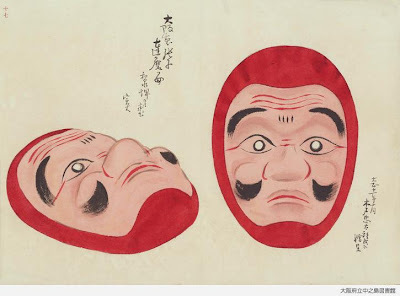 Click HERE to see more of his DARUMA paintings ! At least until page 7 there are almost only DARUMA items ! A remarkable combination of superb artistry, sophisticated design, and a lengthy history of continuous usage sets the masks of the Noh theater of Japan apart from all others. That so little is known outside of Japan about their great beauty and brilliant craftsmanship prompted the author to undertake the two decades of study, research, and writing that has culminated in this work. The result is nearly 800 pages of text and images published in a two-volume boxed edition limited to 1200 copies. 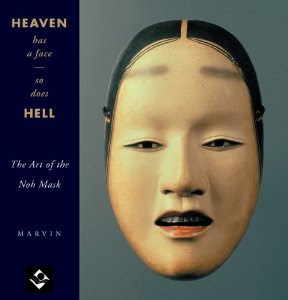 Volume 1 consists of an extended treatise on the history of Noh and the evolution of its masks, including mask forms and functions, types and roles, nomenclature and taxonomy, mask carvers and their lineages, signatures, and other markings. It includes plot and character synopses of the plays most often staged as well as others rarely performed, with particulars about the masks used by various troupes for the principal roles. Volume 2 is an album showcasing in full color over 140 of the finest masks of Noh, both ancient and more recent, with detailed information on their creation, character, and significance, as well as photos of their backs showing inscriptions and artists' signatures. An extensive bibliography, glossary, and index round out this presentation of an exquisite, centuries-old art form. No existing publication on the subject, in either English or in Japanese, remotely compares in scope and depth to the present work. Japanese archaeologists have found the country's oldest known wooden mask, believed to date back more than 1,800 years. The team, from a municipal education board, unearthed the find at the Daifuku ruins in Sakurai City, Nara Prefecture, in western Japan. The mask is a little over 23 centimeters long and 7 centimeters wide. It appears to be split in half lengthwise. If complete, the object would be about 16 centimeters wide. The visage is made from a conifer called Japanese umbrella pine. It has 2 holes, one for an eye and the other for the mouth, and another small hole measuring 2 millimeters in diameter near where the ear would be. The archeologists speculate that the hole was used to put the mask on with a piece of string. Pottery unearthed alongside the mask suggests the face-shaped object dates from the latter half of the 2nd century. 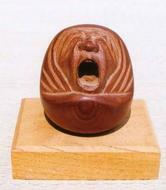 Another wooden mask dating back to the early 3rd century was discovered in 2007 at the Makimuku ruins in the same city. The ruins are said to be one of the sites where the ancient Yamatai Kingdom was situated. The archeologists say the latest find is dozens of years older than the one from Makimuku. Keiji Niwa, who is a member of the education board, says his team believes the masks were used at religious ceremonies. By the 15th century, the Japanese dramatic art form known as Noh had coalesced out of various performing arts into a sophisticated masked drama, but the first Noh masks were extant well before then. 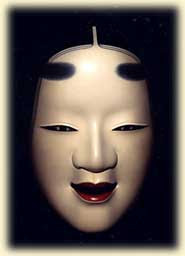 In other words, the first generation of performers adopted existing folk masks for the Noh stage. Initially, only the roles of deities and demons were masked. As the repertoire broadened and the content became more complex, new characters were created, and actors began wearing masks to portray mortal men and women. This development catalyzed the creation of masks expressly for the Noh stage.